The best Reading Experience on the Mac. 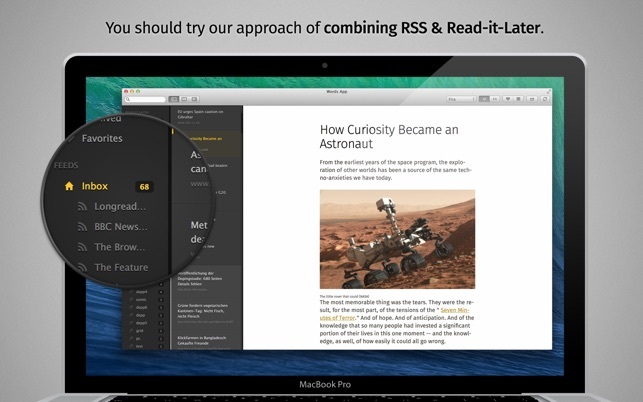 We sync all your RSS & read-it-later articles down into your inbox. 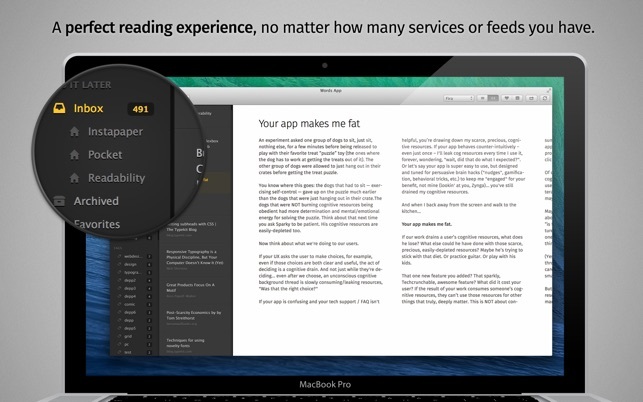 No matter which service you use, Instapaper, Readability or Pocket. We treat them all with the same love & attention, focused on readability & typography. And we process every article & sync down on your desktop computer, so you can read it even if you haven’t got a working internet connection. Our approach on making RSS better. RSS feeds that automatically fetch the whole article behind the short teaser text, get rendered in Read-it-Later style and put into your inbox for your reading pleasure. As soon as you find an article worth keeping, just pull it into you folders or favorite it, and it will stay forever inside your library. Every read-it-later service provides different features. We think these should be available for everybody. 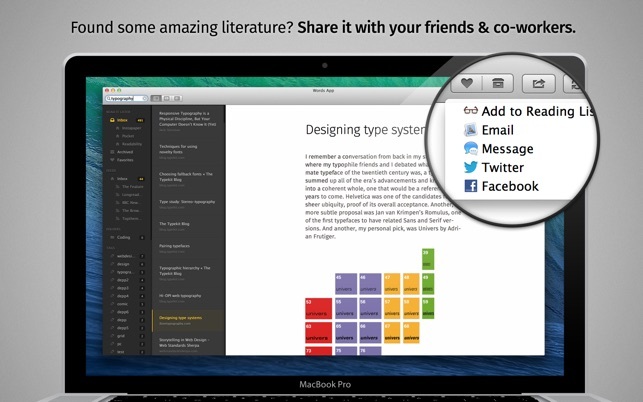 With us, Readability users can put articles in folders & Instapaper fans can tag their articles. We can’t sync these changes back, if your service doesn’t provide them. But you can use them in our app. We want to provide the best possible reading experience on the desktop. Switch from single column vertical reading to multi column horizontal scrolling. Or from white background to a dark background. 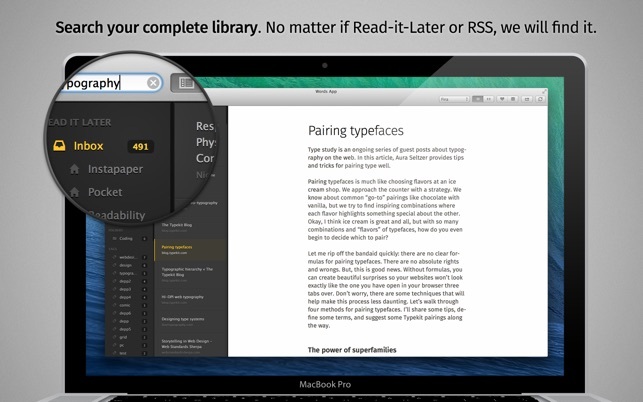 And watch the font sizes change as you scale the window to fit your needs. We want you to have it your way, easy & fast. This app has no help documentation whatsoever. NONE. Furthermore, it will not handle rss feeds in safari, and it doesn’t have built-in browser- click a link and it’s off to Safari. Oh, and there is no way to auto- mark articles as read after a ceratin time period- so if you have more rss feeds than you can read, you will have 1000+ unread articles sooner or later. The one good thing about it is that it does do a good job of getting text versions of the stories. Choose Reeder 2 instead so that you get more theming options, better rendering, better RSS/Read service subscription management, better control overall for the same price. Leaf would’ve also been a competitor had the latest update not break it. Where’s the pretty dark theme as promised in the photo? The reason my articles actually get read. I love using Pocket to save articles to read later, but I've found I only want to read articles on my phone when I absolutly must. Pocket's website isn't exactly optimized for consuming articles so that was out as well. In came this app. Finally I have a great way to organize and read my articles right on the desktop. This app is easily worth the price.